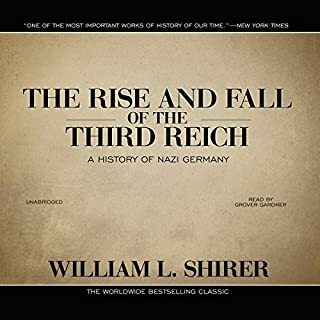 Here is the final volume of the highly acclaimed narrative history named one of the best nonfiction books of the century by National Review. The Civil War: A Narrative, Vol. 3 brings to a close the story of four years of turmoil and strife that altered American life forever. ©1986 Shelby Foote (P)2017 Blackstone Audio, Inc. The book and the story told is amazing. The late Mr. Foote's writing style is so complimentary to the subject matter he is working from. Yes, the book is very long, but I found it very enjoyable. Mr. Gardner's dramatization of the historic characters and his vocal work was superb, and I really enjoyed listening to it. 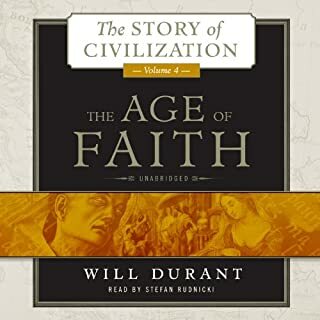 The 3 books together are over 160 hours of listening pleasure, but well worth the marathon. 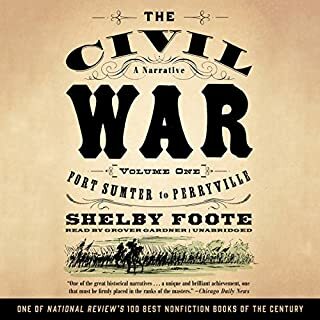 author shelby foote provides the reader with a panaranic view of this complex, tragic span of time called THE Civil War. 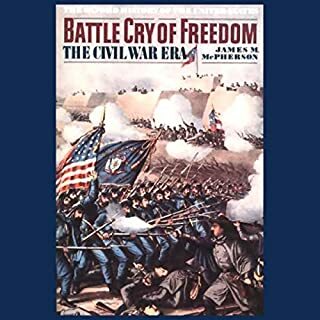 Though the better part of the book details the Civil War battles, military strategy and their outcomes, he does spend considerable time graphically describing key figures, North and South, who conducted this conflict. 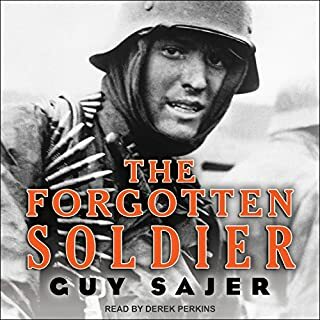 I would like to believe that even the author would have acknowledged that many, many more pages about the war's medical failures and successes were worthy of elaboration, that more comments from black soldiers would have been insightful additions to this tome, that life in military prisons would have expanded upon the cruelty experienced North and South, that the lives of millions of non combatants were painfully, daily, adversely impacted as well as a miriad of other "side" issues were consecutively deserving of mention. 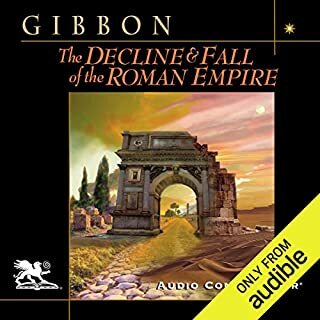 The narration was Superbowl, lengthy but well worth the listen. Thank you . 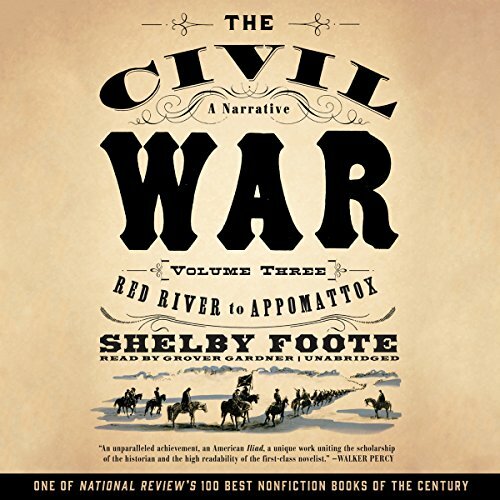 Would you consider the audio edition of The Civil War: A Narrative, Vol. 3 to be better than the print version? I started reading the print version's series years ago, but never finished it; it may have seemed too daunting. 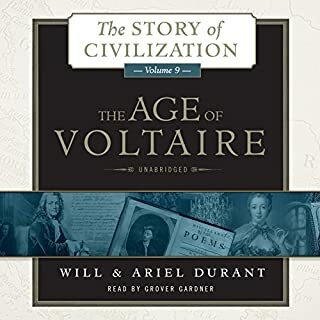 However, having finished the audio version now, I can say that this version captured me more. Yes, I missed the maps, but you can always look those up on the internet. 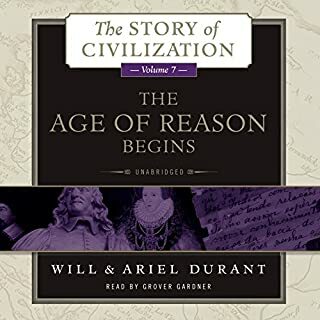 I prefer the audio version because it helped me finish the series, and enjoy even more while doing so. I learned to appreciate two characters more: one major, and one less so. Robert E. Lee is fascinating. His tactics, attitude, leadership traits, and skill on the battlefield brought out his character and influence on the Southern cause. General George Thomas, the Virginian, was also presented well. I learned so much more about him than I'd previously known. I liked his steadfastness and dependability. Students should learn more about this man. His voice matches the time period perfectly. He is not trite, simple, or boring. 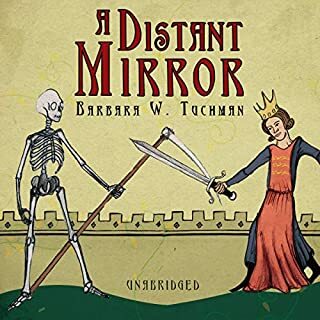 His voice is easy to listen to, his pronunciations are accurate, and he portrays the narrative and its author perfectly. 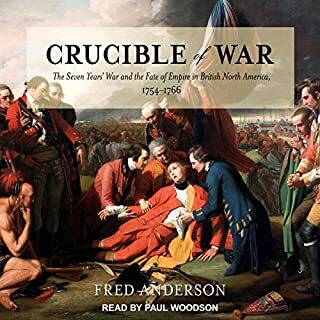 The events portrayed in this volume are perhaps the least known to most Americans (excluding Sherman's March and Appomattox), as they definitely were to me. The Overland Campaign was brutal, and Shelby Foote tells its story in a way that makes it very interesting. I was amazed by the shear scale of those sets of battles, and the determination it took for the Union to follow through with the campaign. 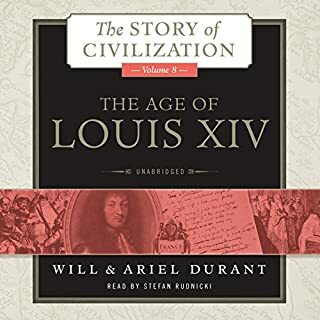 I don't hesitate to say that this series is the best volume of history I've ever read. 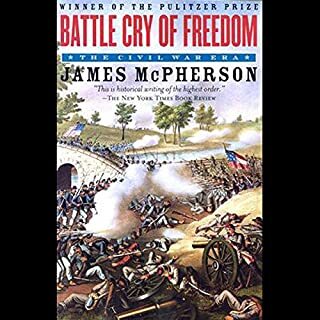 I didn't consider myself a student of the Civil War before reading; now that I'm finished, I look forward to reading more about this tragic period of American history. Thank you to Shelby Foot and to all those who helped gather the information for this book. I have come to many of the same conclusions in my mind about the Civil War prior to this book. This just reaffirms my thoughts and impressions. I am grateful but it was put together in such a way that made the understanding of the battles in the Civil War more understandable. The narration by Grover Gardner was fantastic thank you for doing such a great job. 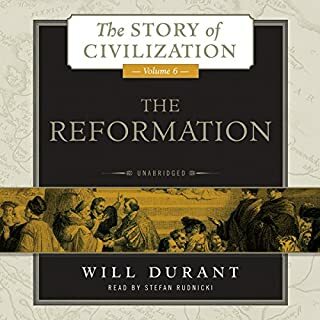 What’s the Audible equivalent of a page-turner? Non-pauser? I did not want to stop listening to it. Whereas the first 2 volumes had their lulls. I imagine the actual war had the same pattern for those that lived it. The last chapter maybe the best. I did expect there would be much to add, since the title states Appomattox as the final stop. But the reflection on the cost of the war (in terms of lives lost) and other points really brought the story forward. People tend to talk of the Civil War in terms of heroes and villains. 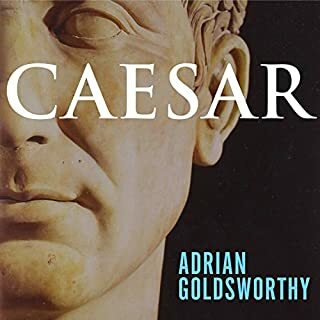 After this book, I have a greater appreciation of the collective costs to the entire country, the trauma of the event (some effects are still with us), and also the opportunities that came from it (our military might has its true beginnings here). Wow that was a lot about the Civil War! After listening to all three of Shelby Foote's Civil War books over the last 2 months I feel fatigued. He packs a whole lot of information in each book and it is a commitment of nearly 160 hours to get through them all. 1. Foote does a great job of providing information on nearly every significant event and battle of the Civil War. 2. Even with a good knowledge of the subject I still learned a lot of new information. 3. 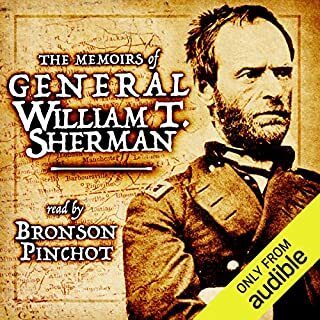 Listening piqued my interest in a few different way and I want to learn more, specifically about the battles that my great and 2nd great grandfather took part in as Union soldiers from Wisconsin. 4. I don't really know anything, except the term Carpet Bagger, from the Reconstruction and I am interested to learn about it now. 5. I learned a lot about the individuals involved, Lee, Grant, Meade, Pickett, Davis and others aren't just names anymore. I feel like I know them, at least a little bit. 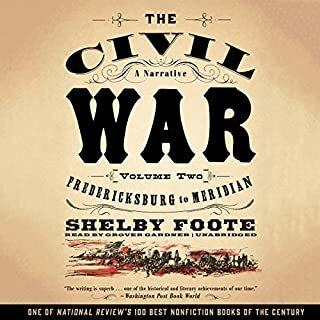 Finally, there is a reason that Shelby Foote's Civil War: A Narrative is considered a classic, it is captivating and informative on a level beyond any other history books I have read. The very detailed narrative is weighted toward southern victories. Example: every victorious action by Bedford Forrest related in detail. His final action, in which he was routed, gets only passing mention. I may reread Bruce Carlton as an antidote. 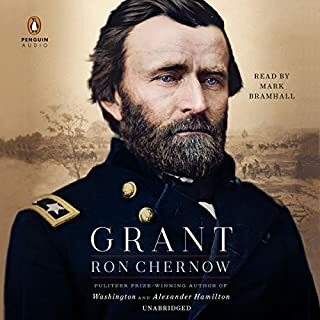 very complete but written with confederate sympathy....excellent narration...understandable that the confederate sympathy comes from the origin of the writer. Extraordinary in writing, poetic in language and phrasing. I had a tear in my eye at the end. Shelby Foote will transport you back in time. Wow. There are not enough adjectives to describe how good this book is. The entire narrative series is a marvel, unparalleled. 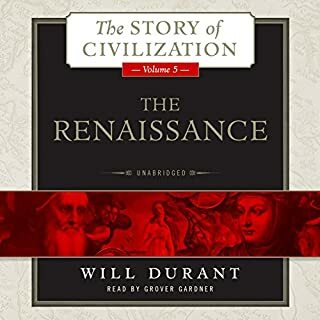 It’s so rich in depth, and the narration of Grover Gardner makes it utter perfection. You could not add more to this in any way, shape or form. It is a pure delight.